Classed as a species of marine megafauna, the whale shark is the world’s largest fish: the biggest recorded was a colossal 20 metres in length, weighing 42 tons! Yet surprisingly little is known about this gentle ocean traveller. We are still to discover much about the mysterious lives of whale sharks – how far they travel, where they go to breed, give birth and how they spend the first few years of their lives. In 2016, they were re-classified from vulnerable to endangered on the IUCN Red List of Threatened Species, meaning that numbers have significantly declined. The Galapagos Islands plays host to visiting whale sharks, usually between June and December, where they can be spotted around the northern islands. Unlike other parts of the world, where groups often consist of smaller males, the whale sharks visiting Galapagos are mostly large, mature females, many of whom are pregnant. 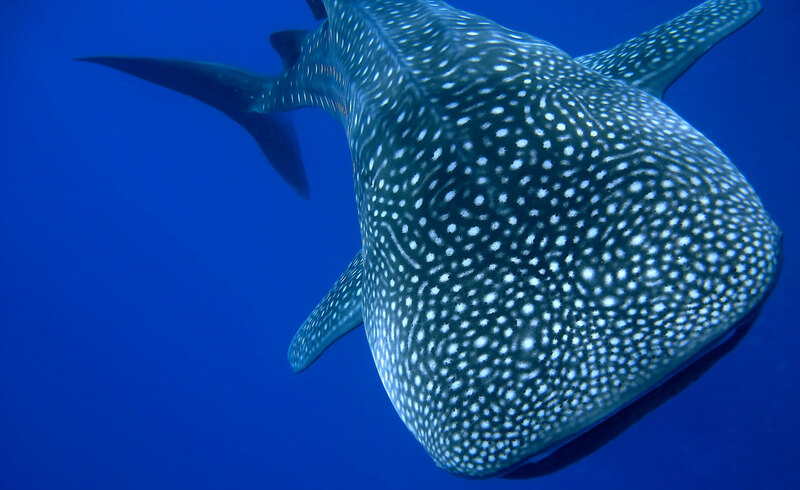 Offering an exciting opportunity to explore and improve our understanding of whale sharks, their migratory patterns, breeding patterns and behaviour, the Galapagos Whale Shark Project aims to improve our knowledge and understanding of these elusive fish. Discovering more about their enigmatic lives means we can help protect and conserve both them and their fragile environment. Read ‘The Great Whale Shark Mystery‘ from scientist and explorer Simon Pierce. What is it like to swim alongside the biggest fish on earth? Deep beneath the waves, scientists are exploring ways to learn more about the world’s largest species of fish.